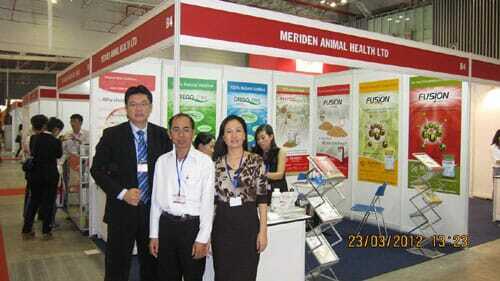 VIET NAM - Meriden Animal Health Limited exhibited at Ildex Viet Nam last week, welcoming the opportunity to greet old and new customers alike. Meriden’s stand was located at the entrance to the hall and attracted many visitors keen to find out more about Meriden’s range of natural products. Meriden’s Technical Sales Team was on hand to help answer any queries on the product range. Regional Sales Manager, Dr Kelvin Chong, said ,"It is a pleasure to come to Viet Nam and see the genuine enthusiasm that feed producers, farmers and nutritionists have for Meriden’s range of 100 per cent natural products. The show was extremely positive and we will continue to build on the success we already have here in Viet Nam."